Rev. 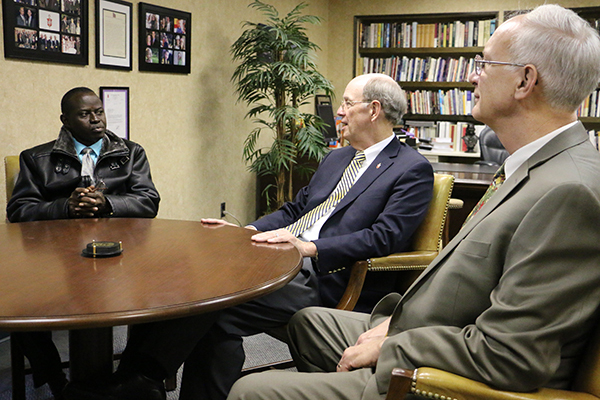 Roosevelt Goah brought greetings and gratitude from Liberia during a visit with Bishop John Hopkins and members of the East Ohio executive staff at the conference Area Center on October 28. The Rice Bucket Challenge, launched one year ago in East Ohio, brought attention to the fact that the deadly Ebola virus was also causing people to die of starvation because they couldn’t afford to buy food after prices were raised during the outbreak. Donations to the Rice Bucket Challenge poured in from around the conference, and from across the country. The collected funds were used to purchase 100 lb. bags of rice, which were given to the Liberia Conference district superintendents to distribute to the their local churches so that parishioners would not go hungry. Rev. Goah timed his visit to the Area Center so that he could also express gratitude to the East Ohio United Methodist Foundation during its board meeting. The Foundation promoted the Rice Bucket Challenge and has, for many years, faithfully supported ministries at the Camphor Mission Station, and throughout Liberia. This is the Rev. Goah’s first trip to The United States. He also brought greetings from Bishop John G. Innis of the Liberia Conference during visits to the Virginia Conference and the Baltimore-Washington Conference before coming to East Ohio. 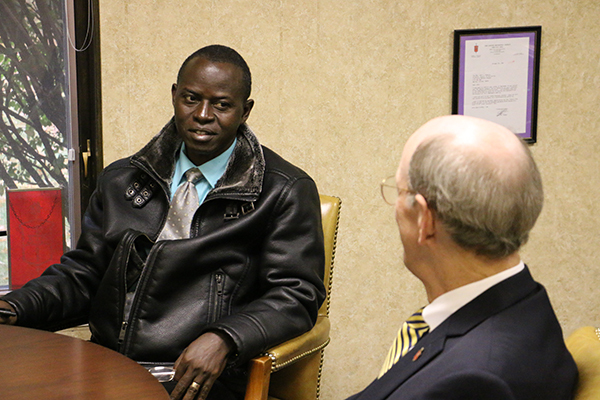 During his stay here he is speaking in churches, visiting mission sites, meeting new people, and reconnecting with those he met during their visits to Liberia. November 13-14 Rev. Goah will participate in the national Liberia Partners Summit & Mission Education Event in the Detroit Conference. The purpose of the summit is to coordinate and maximize partners’ mutual efforts in evangelization, education, health care, and economic opportunities in Liberia. *Rick Wolcott is the director of Communications for the East Ohio Conference of The United Methodist Church. Previous postNorth Central Jurisdiction will retain nine Episcopal Areas in the next quadrennium.